The late Bruce Lee founded Jeet Kune Do, because he felt the martial arts were too confined. "You can't fight in pattern", he used to say, because an attack can be baffling and not refined. Jeet Kune Do is a devastating combination of speed; power, and deception - JKD stands alone as today's only non-classical form of Chinese Kung Fu. What sets JKD apart from all other forms is the absence of stereotyped techniques; it is alive, fluid, continually adapting. Sometimes it resembles Western Boxing, at other times it looks like Wing Chun, Thai Kickboxing, or Fencing, Judo, even wrestling. Using "no way as way" and having "no limitation as limitation" is that JKD is truly about. Absorb what is useful; reject what is useless; add what is specifically your own. JKD is a means of self-discovery; it is an investigation of freedom - freedom to act naturally and effectively, not only in combat, but also in life. Jeet Kune Do is training and discipline toward the ultimate reality in combat. The ultimate reality is returning to one's primary freedom, which is simple, direct and non-classical. A good JKD man does not oppose force or give way completely. He is pliable as a spring; he is the complement and not the opposition to his opponent's strength. He has no technique; he makes his opponents' techniques his technique. He has no design; he makes opportunity his design. 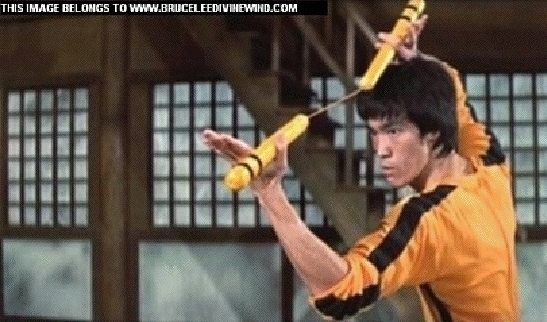 If Martial Arts are philosophies, then Bruce, being the genius that he was, is undoubtedly the Emmanuel Kant of fighting. His teachings are actually the source of a research article that I plan on doing for either Black Belt Magazine or the Asian Journal of Martial Arts. Footwork is one of the basic building blocks of JKD - keep your distance, be in control of it, 'flow like water'. Coincidentally, I was told you guys were training with footwork at practice while I was posting this. Psychic powers, activate! 2. To learn to die is to be liberated from it... free your ambitious mind. 3:50 - Bruce Lee swinging giving two guys airplane rides. Wow is the song really that long?